This is entirely in keeping with the higher prospects of growth in Asia and Latin America compared with growth prospects in the West, where banks still have toxic assets on their books and high levels of consumer indebtedness have to be brought down. It’s also worth remembering that the financial crisis was already over a year old when Lehman Brothers was allowed to fail. India’s stock markets had plunged when the crisis first erupted but had then found some stability. 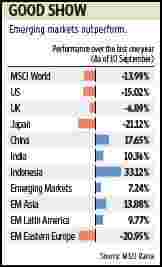 The Sensex, which closed at 14,483 on 1 September 2008, was about 1,000 points higher than its level at the end of June. It was the policy error of allowing Lehman Brothers to fail that led to panic and to the credit crunch. The rise in the markets, therefore, has been the logical result of the disappearance of that panic. What’s more, the Lehman scare led to unprecedented pumping in of liquidity by central banks, some of which has found its way to the markets. Note that while the Sensex is now already above the level it was at prior to the Lehman bankruptcy, the economy is nowhere near that level. India’s gross domestic product growth during the September 2008 quarter was a healthy 7.7%—today, not even the most optimistic forecast for the current year is anywhere near that number. What explains the divergent paths of economic growth and the rise in the market? The increase in liquidity. Also, the initial bounce- back in the markets was relatively swift, simply because the fall was induced by panic. Now that the markets are on a more even keel, the rise will be determined by the fundamentals, which are likely to improve only gradually. Liquidity, though, will continue to be a wild card.